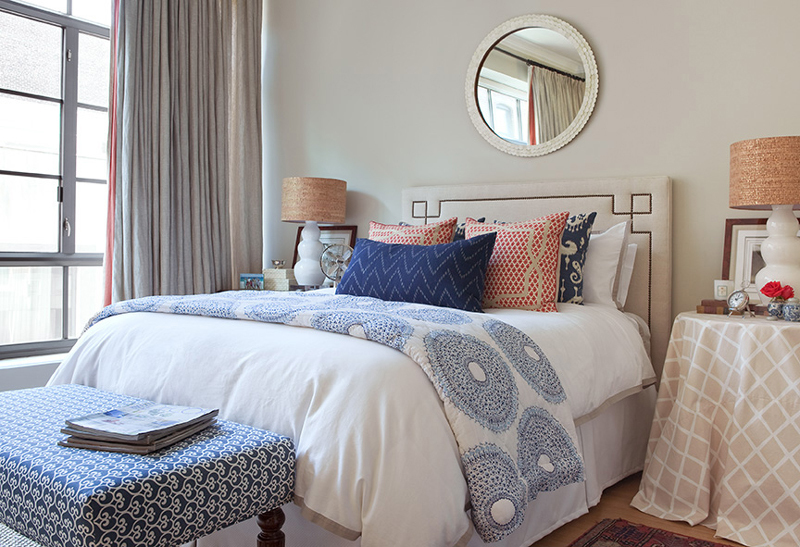 Create a sleeping space that's clean and calm (and anything but boring!) 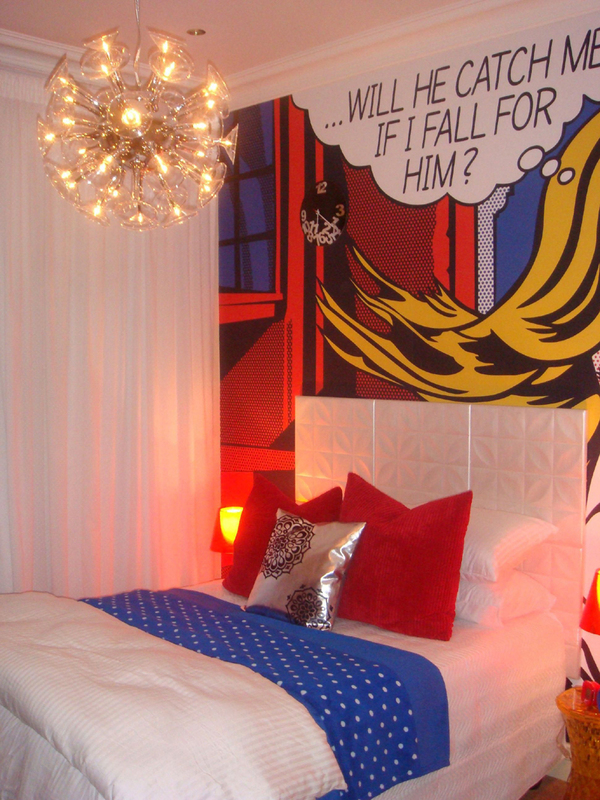 with our white decor ideas for your bedroom. 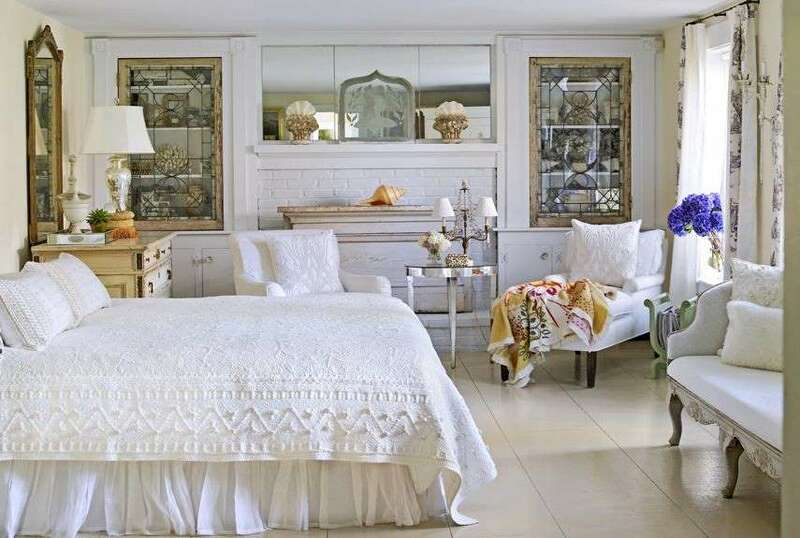 The mix of antiques found in this Hamptons master bedroom feel fresh thanks to the white walls and soft hues chosen for the furniture. 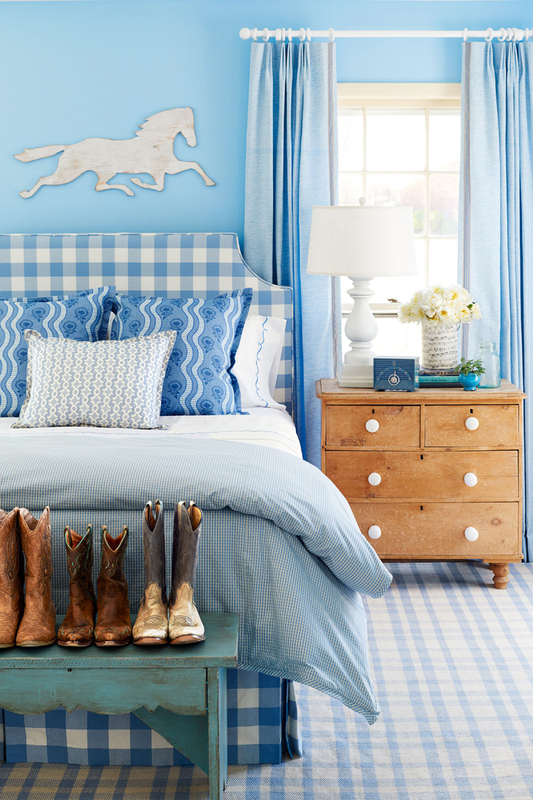 A mostly white bedroom can still feel fun with a few colorful moments. 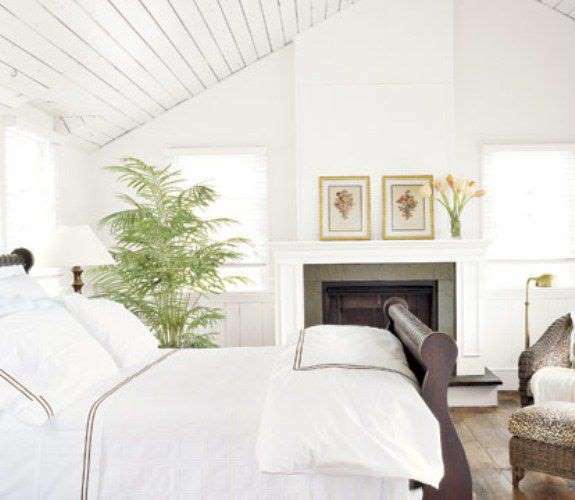 In this historic Santa Barbara home, the master bedroom, which was once a porch, houses white furniture and accessories with just a few blue and purple linens. 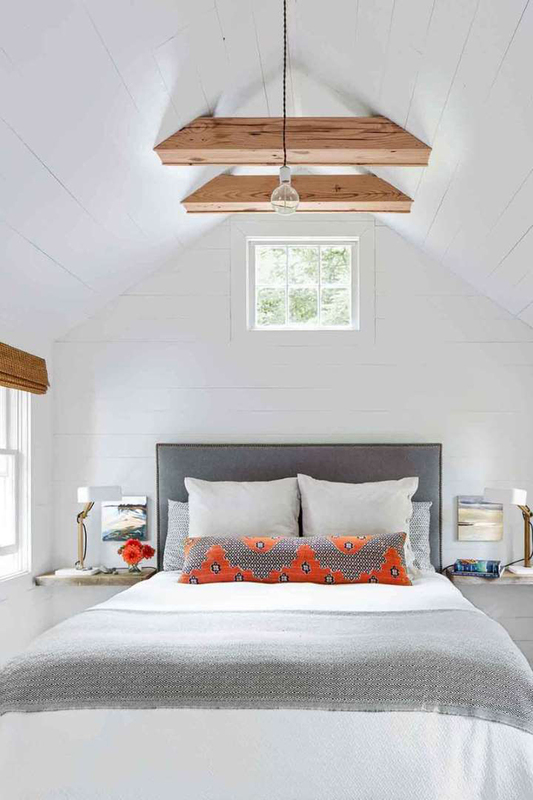 Take a cue from the owner of this dreamy Michigan lake house and add some interest to your white bedroom by installing wide-set panels on your walls. 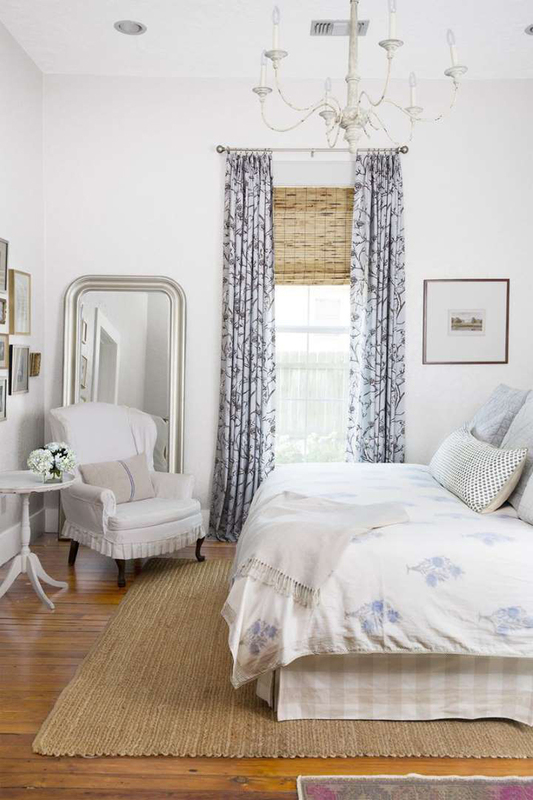 With washed out furniture, floors, ceilings, linens, and more, this large bedroom needed something warm and special, which inspired this Mississippi farmhouse owner to feature one bold wall with a stenciled wallpaper design. 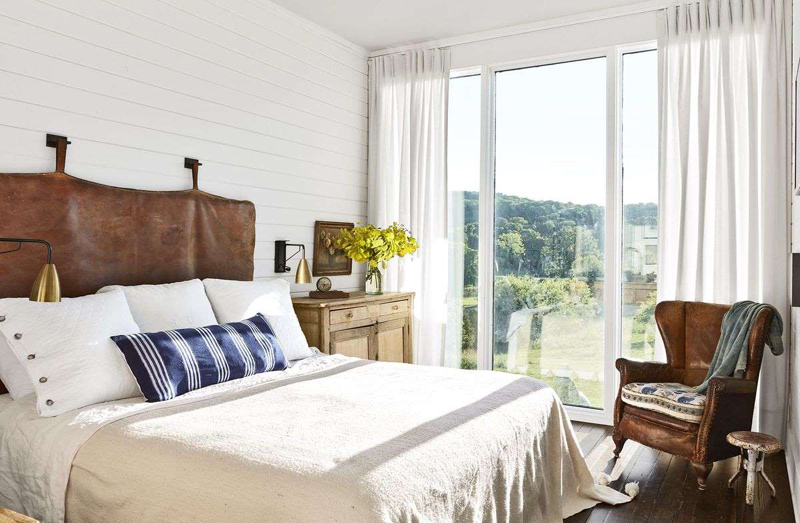 Even a leather headboard and chair can't overpower this airy barn loft found thanks to its floor-to-ceiling windows that let in plenty of natural light. This white paneled-covered barn loft feels extra big and open thanks to minimal furniture and the neutrals featured throughout. 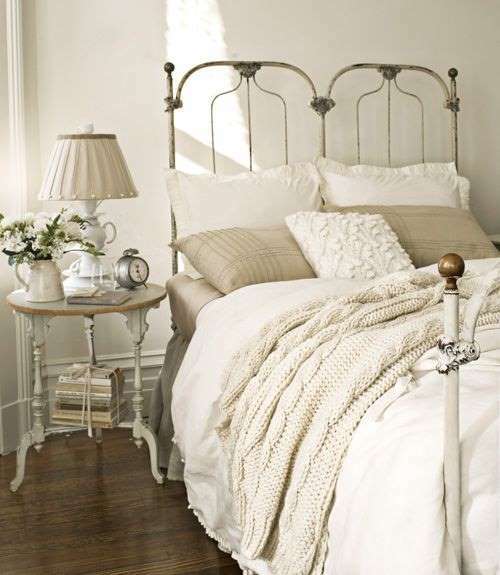 Prevent your space from feeling cold and stark by featuring warm white shades throughout. 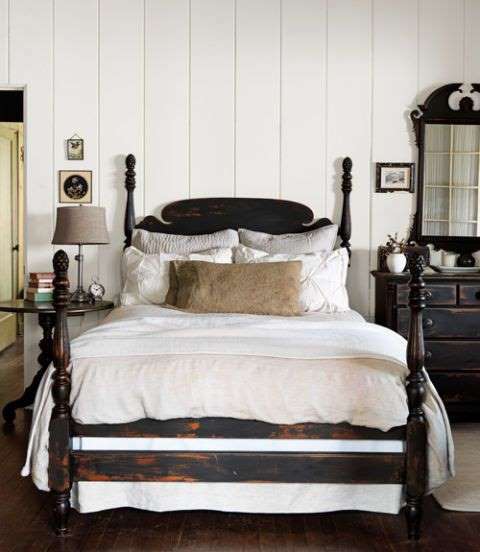 This historic home's bedroom feels cozy and inviting thanks to distressed ivory antiques and peg rail-lined walls. 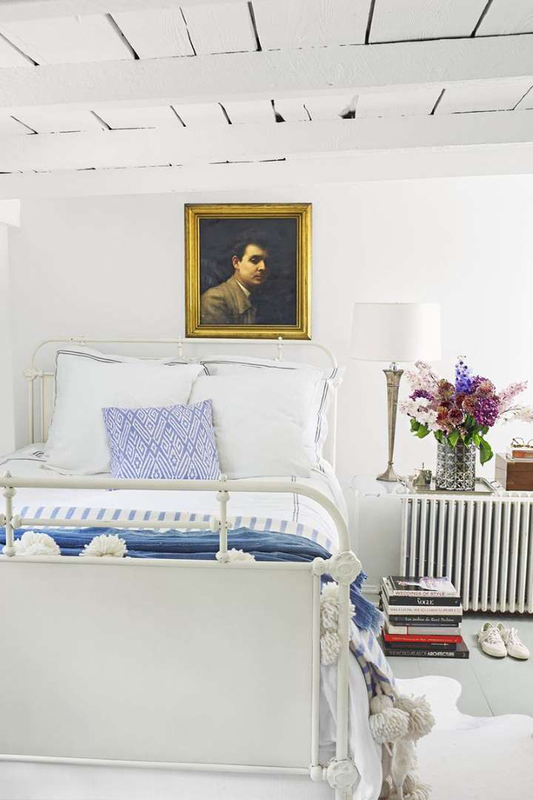 Striped bedding and textured pillows offset this bedroom's all-white color palette nicely. 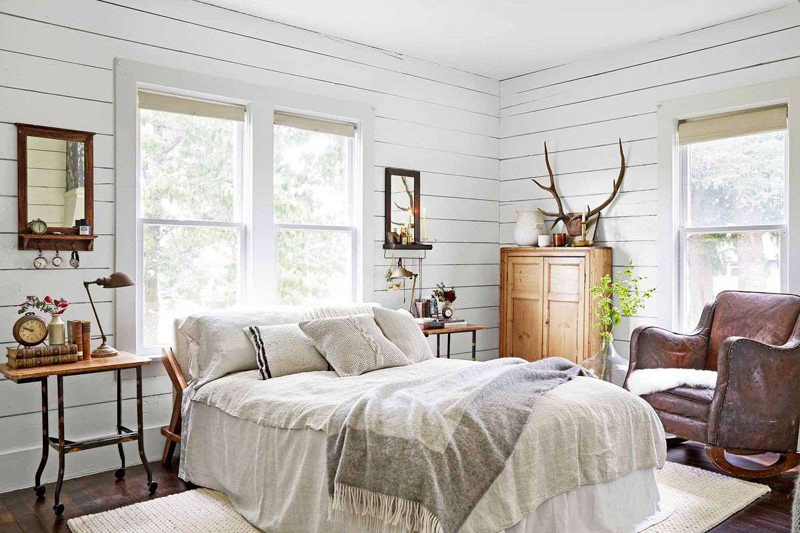 The homeowners of this Washington farmhouse painted their bedroom white, but added a series of neutral items-the platform bed, antique blankets, and old leather chair-to the room to give it warmth. In the early 1900s, this room was created as a "children's tea ballroom." Today the all-white space is a guest bedroom. The designer, Alexandra Champalimaud, selected the Louis XV bed, which still bears the wheels and handles that were used to move it toward a fire or an open window 250 years ago. 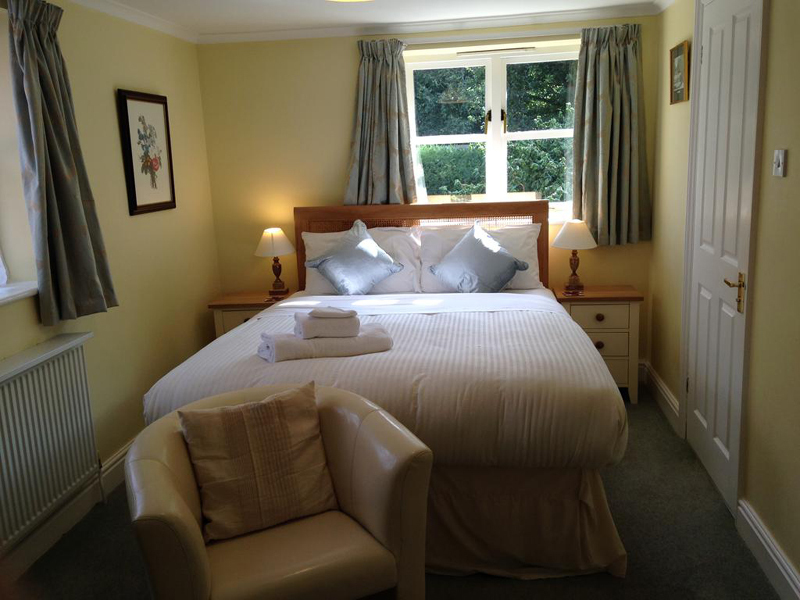 Here, the bed stays put-and offers glorious views of the gardens. In this California home's master bedroom, white bedding pairs with a Garnet Hill striped duvet cover and throw pillows made out of vintage fabrics. 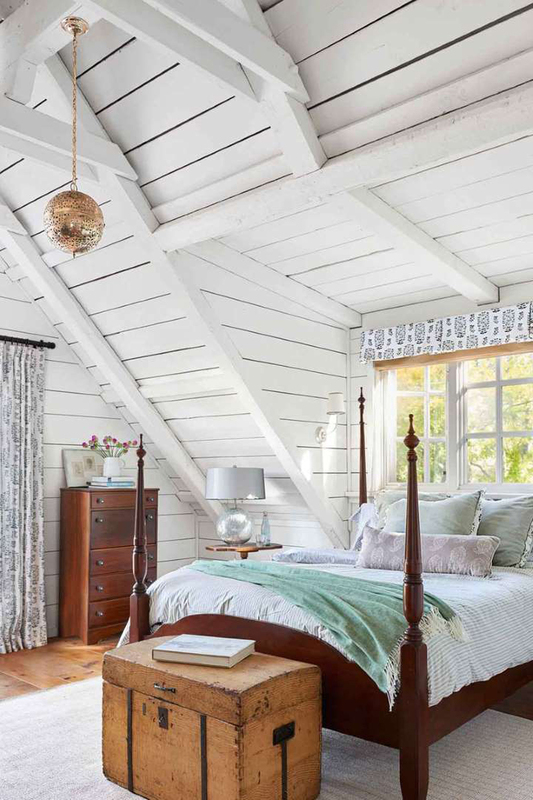 The master bedroom in this Oregon house offers a lesson in mixing old and new: A 1940s mahogany four-poster bed that one of the owners liberated from the barn of a friend's mother-shortly after graduating from the University of Maine-is dressed with pillows by Martha Stewart for Macy's, and an Ikea throw drapes across a pair of 1920s English oak corner chairs. The turn-of-the-century side tables sport lamps from Home Goods. 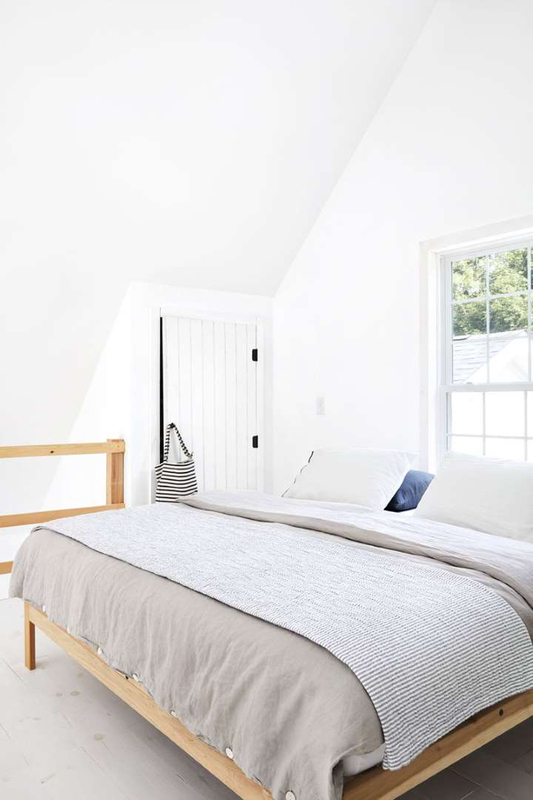 The pantry in this Nantucket cottage morphed into the "Ship's Room," where a built-in daybed evokes a boat berth, beckoning guests to curl up with a good book. 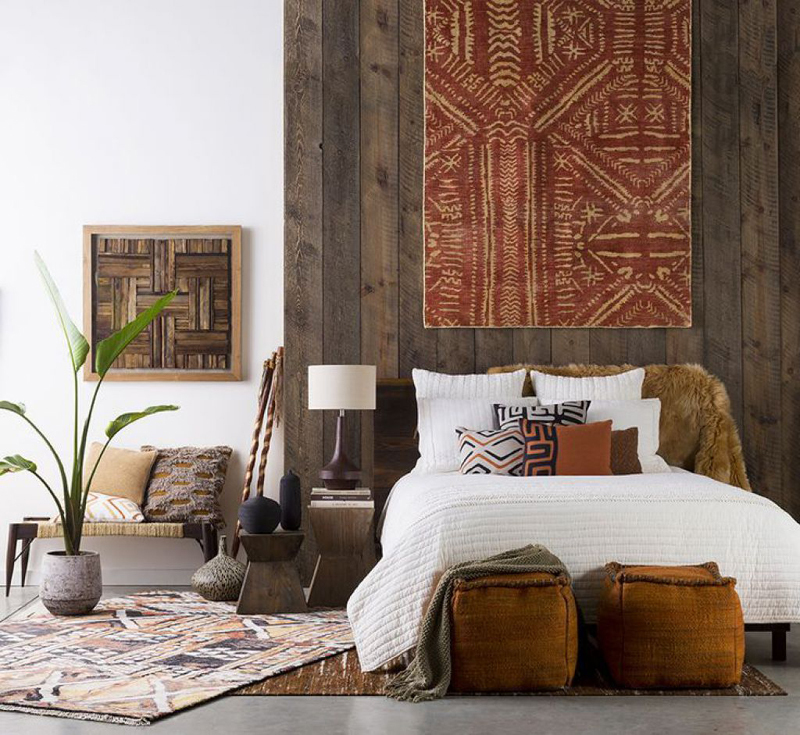 A wooden barrel top and a nautical buoy combine to make timeworn wall art. Whitewashing the walls in the attic bedroom of this Montana farmhouse heightened the drama of its pointed arch. 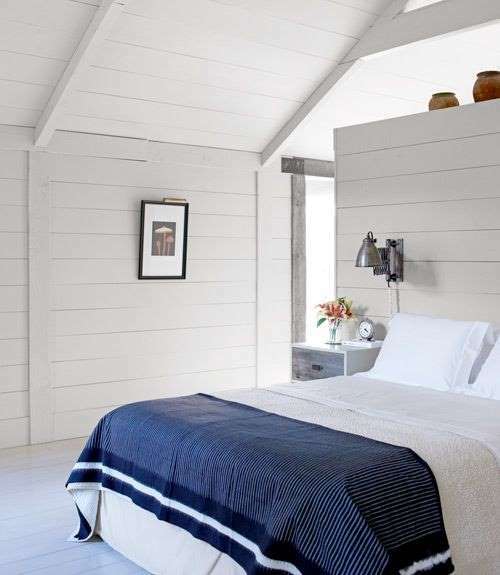 "I love the way the horizontal boards emphasize the lines of the pitched ceiling," the owner says. 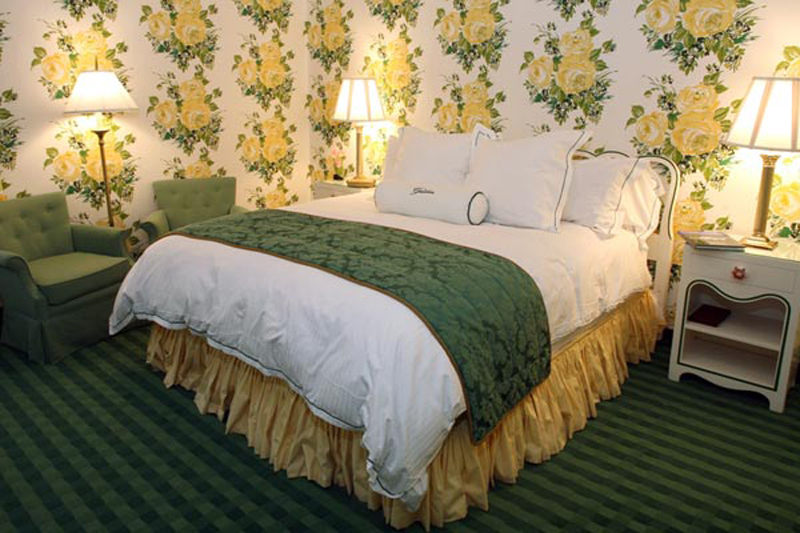 She found the turn-of-the century iron bed on her first trip to Montana; the chandelier came from an antiques store in Santa Barbara. 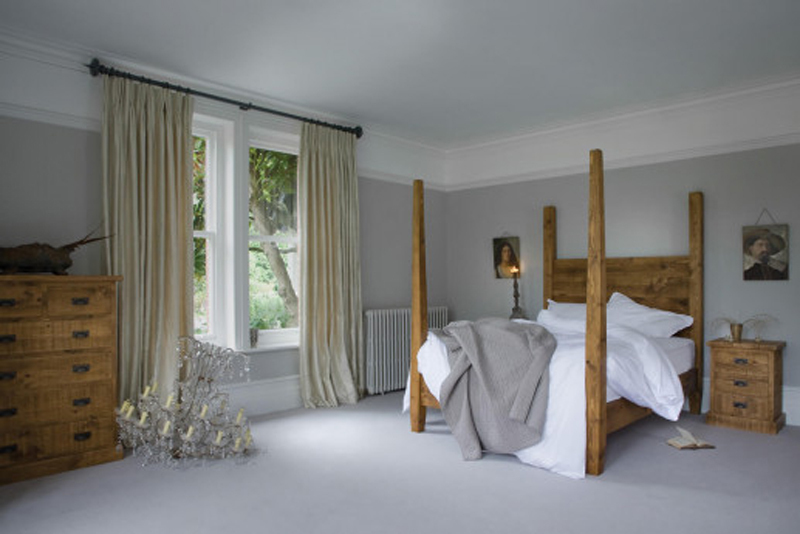 An English Home quilt (on the bed) and Matteo blanket (draped over the banister) keep the scene from feeling chilly. The owners of this Northern California home installed railroad trestles as beams in their bedroom. 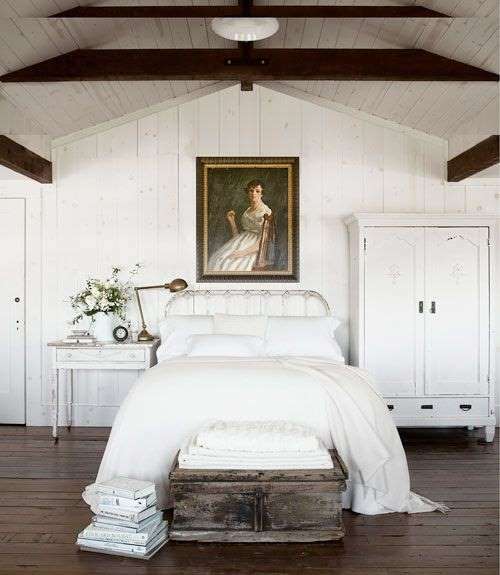 A flea-market oil portrait watches over the antique iron bed, covered with Pottery Barn's fisherman-knit blanket. The walls and ceiliing are painted Kelly-Moore's White. Embroidery adds texture to an interior, while mirrors and mirrored surfaces-in a lamp, tray, or table-make spaces sparkle. Use glass-doored cabinets to highlight favorite items, like the shells and ironstone shown here. Built in 1932 as the prototype for a planned community on Lake Michigan, this cabin came with a jumble of Old Hickory furniture-antiques that today carry an impressive appraisal. Instead of fighting the lodge vibe, the owners embraced it, tweaking things here and there to suit their style. 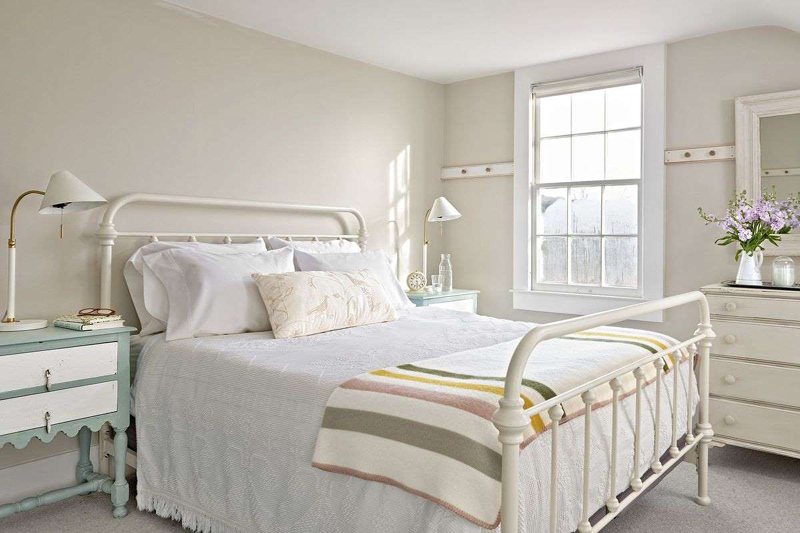 For example, they painted the master bedroom's 1930s maple bed and dresser black, then "aged" them with a sanding block. Linens by My Adobe Cottage adorn an Ikea bed in this simple, cozy child's bedroom. 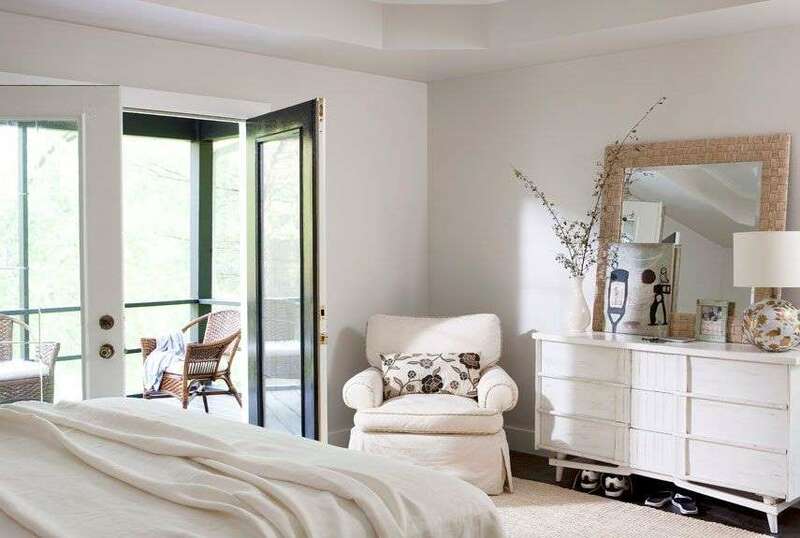 This master bedroom's pale palette incorporates different shades of white, cream, gray, and green. 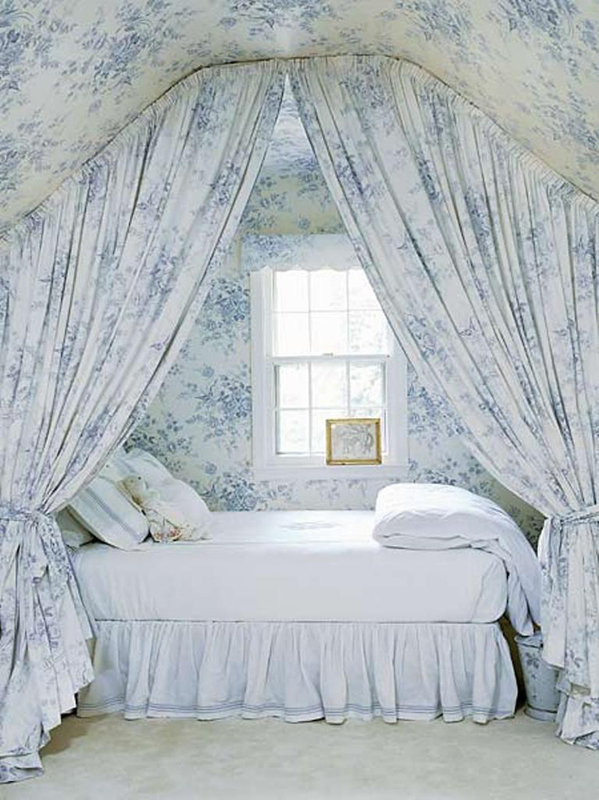 The linen headboard cover is by Shabby Chic. Not all whites are the same. Once you start layering different tones, you can't assume they'll all go together. You've got to look at them next to one another to see if they blend. 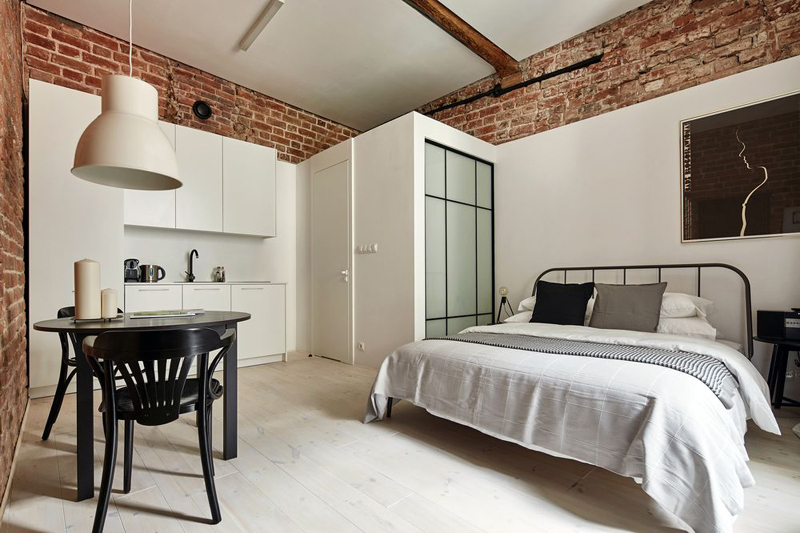 White is fantastic at softening architectural quirks. If everything's painted white, then that odd steam pipe almost magically disappears.